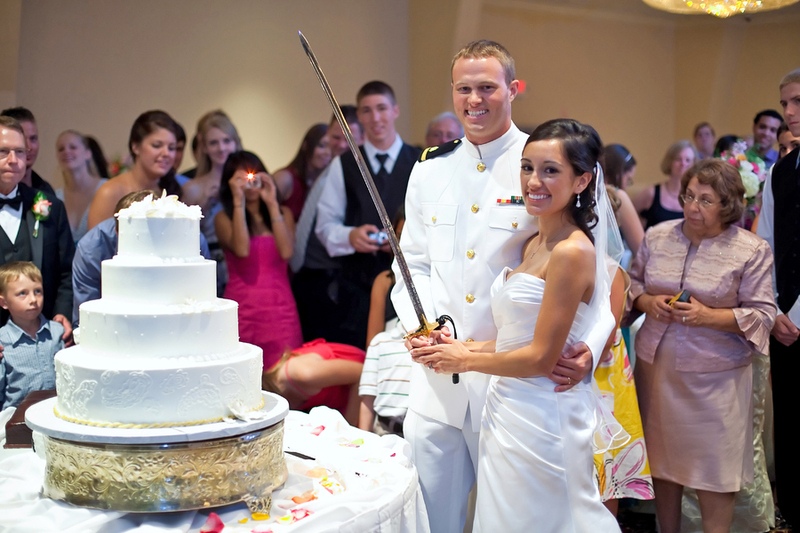 A Military Wedding is in many respects just like any other wedding in the U.S., but what sets this ceremony apart are some traditions, rituals and attire that aren’t common in civilian weddings. Rich in pomp and circumstance and often filled with patriotism and pageantry, a military wedding is a most sophisticated affair and can provide a treasure trove of wonderful memories captured in captivating, classy and timeless images. Typical customs such as formal invitations and pre-nuptial events apply, but there are of course many that are different from civilian tradition – for example, if you are to be married by a military chaplain, you’ll want to start planning months in advance and don’t forget to extend a formal invitation to him or her and their spouse to attend your reception. And when you’re planning the seating arrangements make sure to seat your or your fiancée’s Commanding Officer and their spouse with or near your immediate family – flag and general officers typically are accommodated immediately behind both families. The attire that is worn on the day of the wedding is what most readily sets the overall ceremony apart from civilian nuptials. As the bride, you are free to choose between your uniform and a traditional white wedding gown – the groom however will wear his uniform. The level of dress will depend on the kind of wedding you plan. Ultra-formal and formal weddings will call for Mess Dress uniforms (make sure to indicate that on your invitation!) There are other factors you’ll need to take into account such as the time of day, season and yes, even the guidelines found in the Government-issued manual of uniforms. Your respective military fathers, whether active or retired, typically will wear their uniforms and your mother may do so as well, but most often will choose to wear mother-of-the-bride attire. You won’t need boutonnieres for the groomsmen as that is not the custom – they will instead wear their military decorations. Finally, your non-military guests will simply wear traditional wedding clothes of comparable formality as those in uniform. 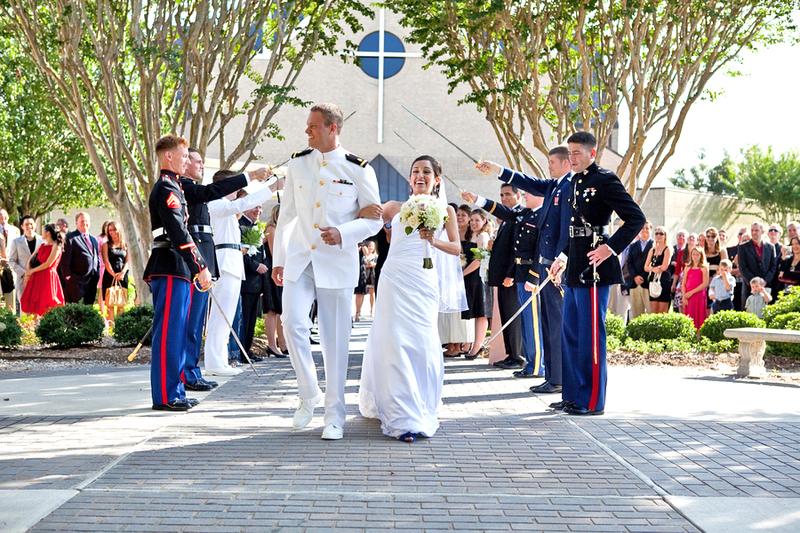 Some military weddings take place in a military chapel or on the grounds of military academies, which typically means that there will be rules for decoration. At most, candelabras, flowers and additional decorations are usually provided and are set for all weddings, while some chapels and churches may not provide any décor leaving the door open for your interpretation. As to who will officiate your wedding, most of the time when couples marry in a military chapel the chaplain will be the one who marries you, although sometimes couples will invite a civilian clergyman to co-officiate. After the ceremony of your religious persuasion, a timeless military ritual will take place when you and your husband walk under the Arch of Sabers. This is a classic photographic opportunity and you’ll want to make sure your photographer is poised to capture the moment as you pass beneath 6 to 8 officers who will hoist their sabers aloft with just the tips touching to form an arch. And if you are not a member of the military be prepared for the customary sword swat on your rump from the last saber bearer as he welcomes you to the branch your new husband serves! Depending on your location and the time of year, you will next most likely want to take the time for a wedding photography session. And just because there are uniforms involved doesn’t mean you can’t enjoy yourselves as well – it’s your wedding day after all so make sure you both relax and have some fun before you head to the next setting. At your reception you surely will have followed seating protocol which calls for military guests to be seated according to rank, leaving the rest up to you to decide. As to music it’s customary to include some regimental compositions, and make sure you play the theme song of the branch you or your new husband serves in – always a crowd-pleaser! As to decorations, another major point of difference between military and civilian weddings is the presence of American flags. 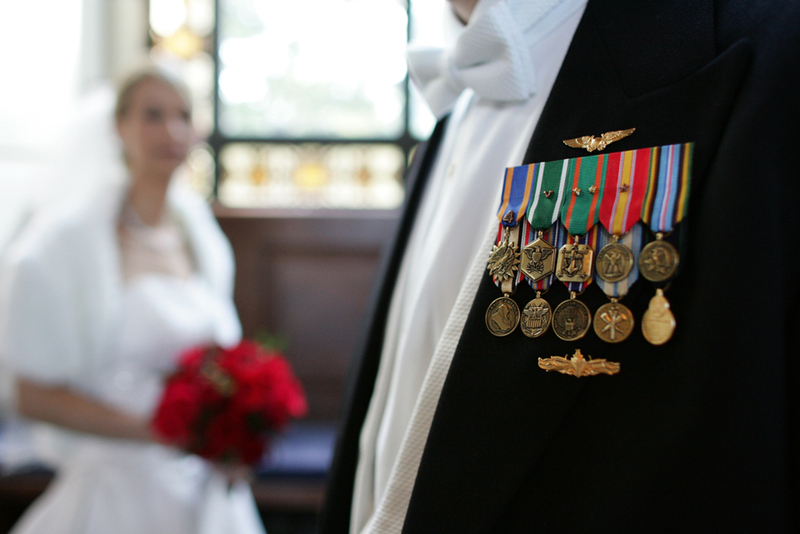 Never out of place at a military wedding, they help to lend a patriotic flair and will traditionally be accompanied by the standards of the unit. Flowers and décor of your choosing will complete the setting of what is sure to be an unforgettable reception. Then, when the time comes to serve desert, another military tradition comes to play when you and your husband slice the cake. He will offer his saber or sword to you and you will make the first cut together as he rests his right hand over yours. This is a truly unforgettable moment and one you’ll cherish in pictures for a lifetime. One last military wedding tradition that is customary is for the midshipman or cadet to give his bride-to-be a miniature version of his class ring as an engagement ring. Then on the day of the wedding a simple band will complete the set as you get ready to begin your lives together!